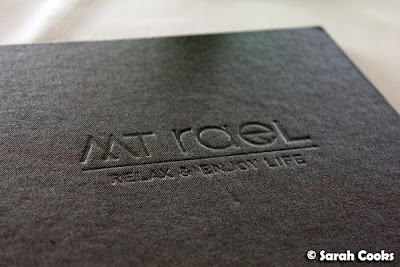 "Relax and enjoy life" - now that sounds like my kind of motto! For lunch on the second, and final, day of our Yarra Valley trip, we ate at the Mt Rael restaurant. Mt Rael is a hotel, restaurant, function centre, and even has an art gallery, but is most famous for its beautiful panoramic views of the valley. 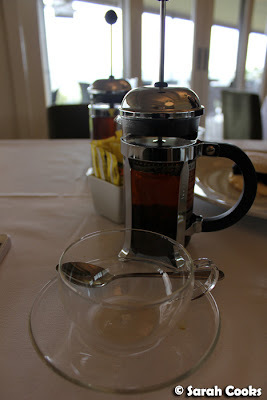 From where we were sitting, it was so interesting to see the weather change, with sunny patches giving way to dark clouds over the afternoon. 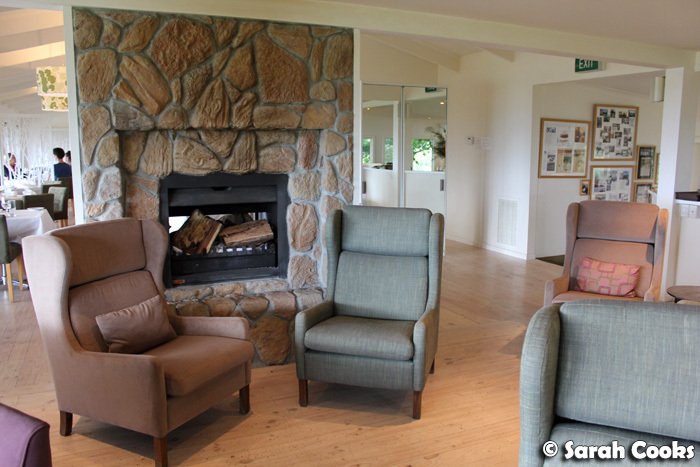 The interior is both spacious and cosy, with lots of natural light, comfortable couches and fireplaces. Mt Rael offers a lunch special: $40 for two courses with a glass of Yarra Valley wine, but we ordered from the à la carte menu. As per our meal at Hargreaves Hill, we shared an entrée and had a main each. 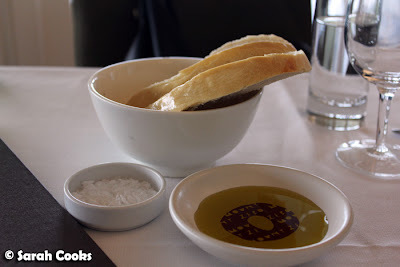 The bread was a little disappointing - soft and quite yeasty, with no discernible crust - it wasn't the best match for the lovely Mt Zero olive oil with which it was served. 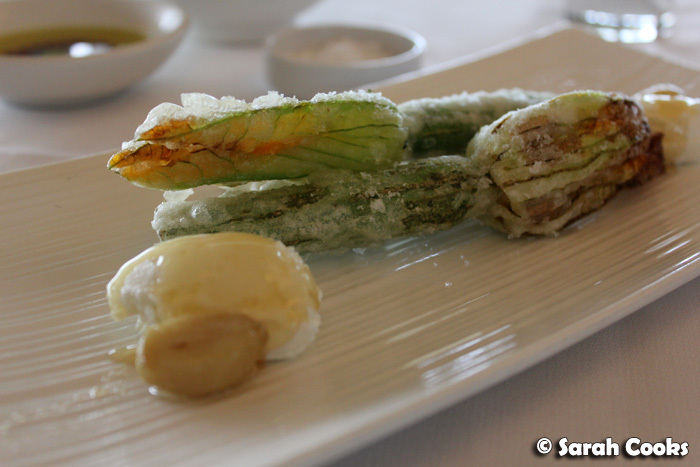 Much better, however, was the entrée: delicately fried zucchini flowers, paired with sweet honey, soft confit garlic and smooth goats curd. 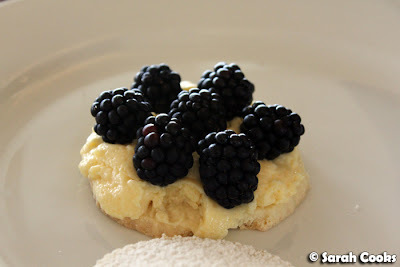 Upon reading the description, I thought the overall effect might be too sweet but the dish balanced very nicely. 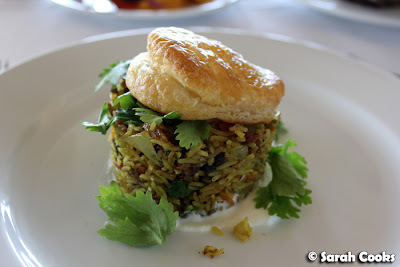 The biryani was presented quite prettily with its jaunty pastry cap - a nice way to bring some interest to an otherwise plain-looking dish. If it was plain-looking, it certainly wasn't plain-tasting - in addition to the rice were caramelized onions, earthy spices, dried fruits, fresh coriander and a splodge of plain yoghurt - delicious! I asked for my steak to be cooked "very rare", but it came out closer to medium, and was a little tough, especially on the crust. Bit of a shame! This has happened a few times at different restaurants, even high-end ones - perhaps I should just ask for steak to be cooked "blue" in future. Fellow rare-meat lovers, any thoughts? 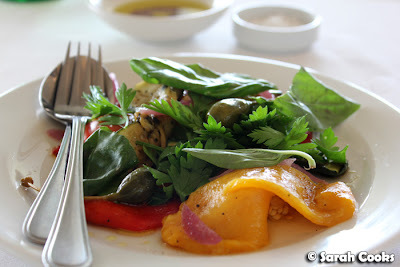 As a side, we ordered the rough cut peperonata - its fresh, vibrant flavours were a welcome contrast to our heavier mains. 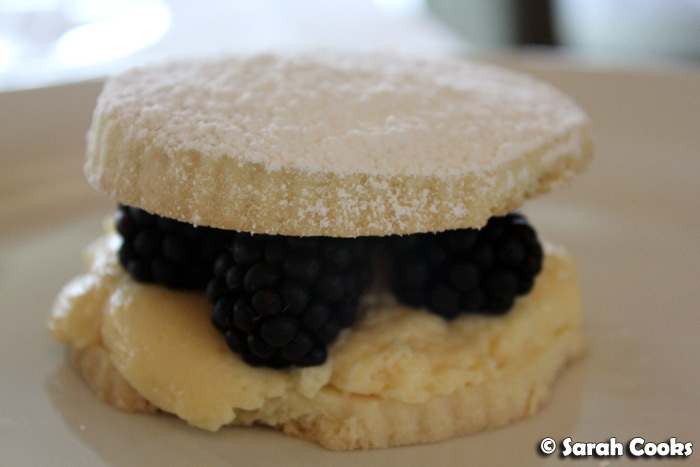 Y'all know that I love biscuits, and I was really happy to see a shortbread sandwich on the dessert menu! Two pale discs of buttery shortbread were sandwiched with a sharp lemon cream and huge, jewel-like blackberries. Not wanting to squish the perfect blackberries, I removed the top disc and ate it separately with a cup of tea to round off the meal. 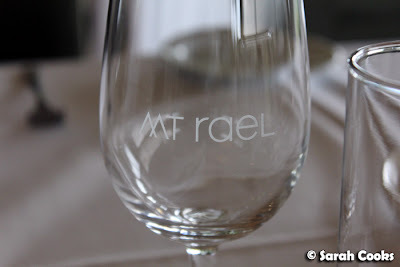 Whilst Mt Rael is a little out of the way - the property is on a quiet, windy road, and the restaurant itself is at the top of a steep gravel drive - it is definitely worth a visit. 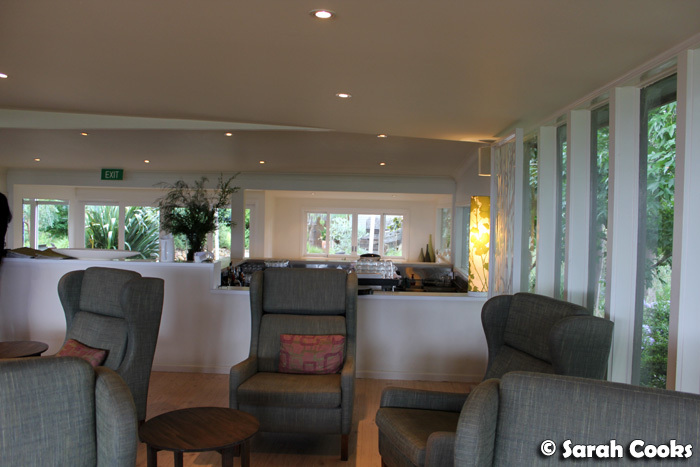 With its warm service and that gorgeous view, it is a lovely, idyllic spot for a relaxing meal. 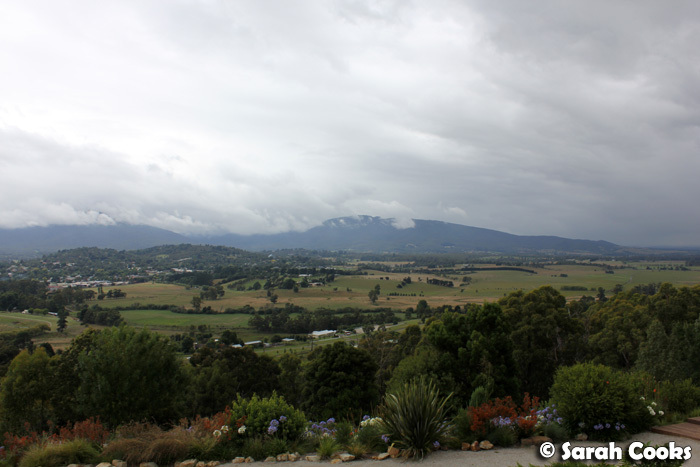 Sarah and Sandra ate at Mt Rael as guests of Yarra Ranges Regional Marketing. 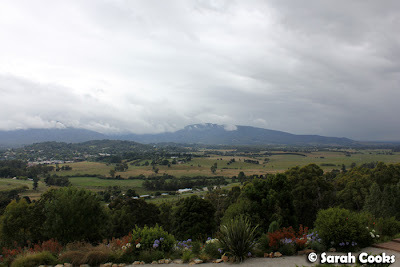 This is the third post from my Yarra Valley 2012 Trip series. 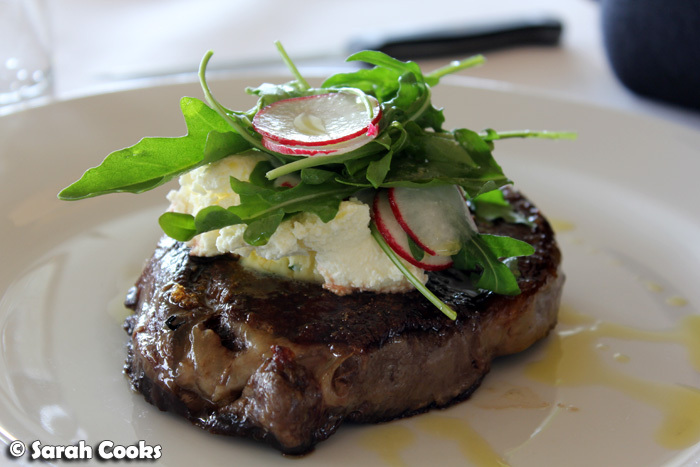 One of my sisters-in-law reckons your steak always comes out cooked a stage further than you request, so she always asks for it to be blue - I've even heard her ask for it to be "basically raw". It seems to work, but I suppose you have to be careful what you wish for and be prepared for your steak to be blue, as you wouldn't have grounds for complaint! Thanks for the tip! Well I'm happy to eat my steak blue, so I think that will be just fine for me :) The funny thing is my partner only eats Very Well Done steak and it never comes out cooked enough! Lol.